Trilochaneswar Temple is one of the old Lord Shiva Temple of Jajpur District which is situated at Jaunlibandha of Jajpurwhich is at a short distance to the south of Biraja Temple besides the stream Hansarekha. This Temple is a old Hindu Temple. It is believed to be a remarkable contribution of Ganga Bansa Kings. This place is very calm place and you can feel the peace of this place. Really it is one of the most attractive spot in Jajpur District. The Trilochaneswar Temple of Jajpur is a gigantic structure built in 1395 A.D., bears beautiful Ganga style of art and the presiding deity is single Mukha Linga. It constitute one of the 69 Swayambhu Lingas in India. The 18 armed Chamunda known as “Naa Hata Deula re Athara Hata Kalli” worshipped as Mahalaxmi inside the temple complex. The accommodation facility can be availed at Jajpur Road and Jajpur town by hiring Hotels and Lodges. For financial purpose, the nearest bank located to this tourist place is S.B.I and a few nationalized banks which are located at Jajpur town. Tourist can reach to the spot by availing bus from Cuttack, Bhubaneswar, Kolkota and from other small cities of Odisha. 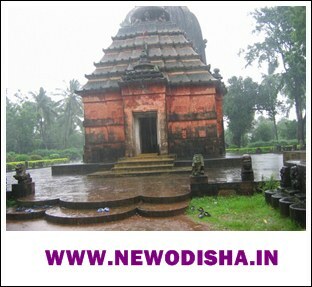 Journey can be more comfortable if tourists hire a four wheeler to visit the Trilochaneswar Temple of Jajpur District. Give Responses for "Trilochaneswar Temple of Jajpur"